We often remind you that good study habits are key to success in school, college and university. 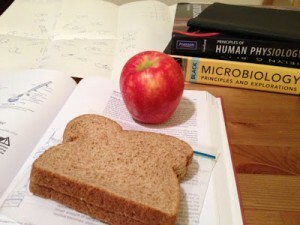 A healthy diet supports your studies by helping you concentrate. Did you know that you can improve your academic potential by eating certain foods and following particular eating patterns for their brain-boosting benefits? Eating regular meals keeps nutrient and energy levels more stable, limiting the temptation of snacks that you might find in the vending machine. Eating three big meals a day slows you down mentally and physically and can also make you drowsy. Rather have 5 or 6 well-balanced, smaller meals, to sustain your energy levels. Peanut butter sandwich on whole wheat bread – This simple sandwich provides protein, whole grains, and healthy fats. Piece of whole fruit – We suggest eating an apple or banana as the healthiest option, but there are so many others including oranges, grapes, strawberries and pears. Cheese and cherry tomatoes – Cheese can be a good source of calcium, protein, and other important nutrients. Finally, you should keep hydrated. Keep a glass of water at your desk to help maintain your energy. Take regular sips and get up from your desk to fill you glass to take a break from your studies. By taking care of what is going into your body, you can make sure that you are one step closer to successfully studying and retaining the information!